Talossa's lovers of the literary arts will be interested to learn that in its earliest pre-Talossan days, Milwaukee produced an epic poet who achieved widespread renown in his day, though he has since been almost completely forgotten. The man was Elbert Herring Smith, known to his Milwaukee friends as “Limpy” Smith, but better known to the rest of the nation as “the Wisconsin Bard”. Smith was born in New York in 1803. When the village of Milwaukee began in the 1830s, the establishment of schools was an early priority. Smith came to Milwaukee in 1836 as one of the first schoolteachers in the area, settling in Oak Creek on the south side of the county. He earned his nickname “Limpy” on account of his limping gait, and was also known for wearing green-tinted spectacles. The Indian, on a high bluff stood! That always did surround him. On things most like to please him. O'er many a mansion and steeple. "O, that the poor Indian might die! For this, I hereby pray." Flung himself off the height! We present to our readers, this morning, the famous poem of our distinguished citizen, Mr. Smith; the production of which places him at once among the first poets of the age. The perusal of it will not fail to discover “internal evidences” of genius such as animated and inspired the bards of other ages. The poem is short for an epic, but brevity is the very soul of wit and poetry, and we are happy to note that our bard has simply said all he had to say and stopped. The review acknowledged that the poem was not perfect, “though approaching perfection”, and offered Mr. Smith some constructive criticism, “prompted by the best wishes for his ultimate success in the path of renown which he has chosen.” In particular, the Sentinel found the line stating that the poem's hero “folded his arms and lit his pipe” to be somewhat obscure. “How he lit his pipe we are at a loss to discover, unless it was by his eyes before he 'cast them up and down,' as we are assured in the second verse he did.” Though these “legerdemain tricks” were admittedly impressive, the reviewer wished for a little more detail as to how they were performed. Wheeler records that Limpy quickly “became the most notorious man in Milwaukee”, and the number of his fans grew with each subsequent effort. 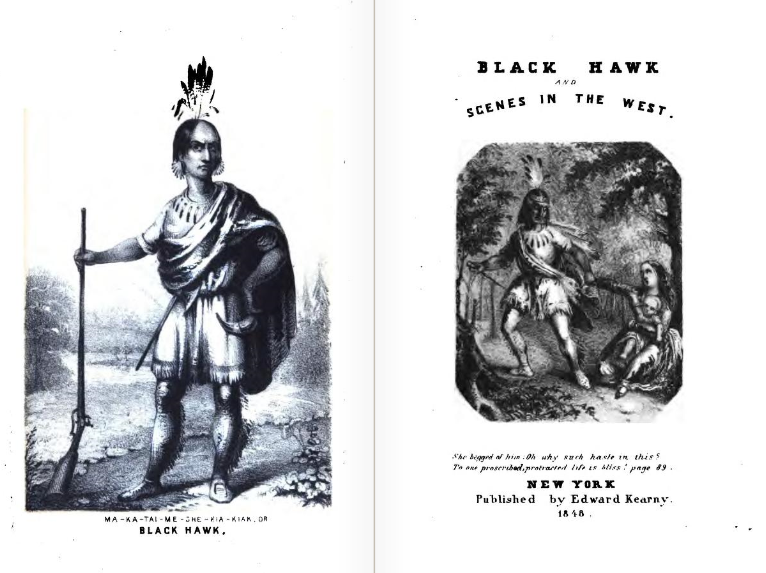 “Every body praised Smith, every body being fond of jokes, especially such colossal jokes as these.” But (at least at first) he took the praise as entirely sincere, and, greatly encouraged thereby, turned his pen to the production of a true epic poem: Ma-ka-tai-me-she-kia-kiak, or, Black Hawk and Scenes in the West. This 274-page work lays out in six cantos the (con:t 5) (con:t 2) story of the Sac & Fox chief Black Hawk, interspersed with vignettes of frontier life. (The Sac & Fox Nation is the American Indian tribe whose modern flag is identical to that of the Kingdom of Talossa.) Smith had the book published at his own expense in Milwaukee in 1846. He was not disappointed by the reaction. Finding Milwaukee now too small a stage for him, he set off on a tour down to Chicago and then off through the East. Smith's fame preceded him as he traveled—in that some of his playful patrons in Milwaukee wrote to friends back east to arrange for an appropriate reception in each city he visited. But proving that no publicity is bad publicity, the over-the-top accolades he received at every stop resulted in sales. According to Wheeler, "The thing became so flagrant, that at last, one or two, not appreciating the joke or else tired of it, went to Mr. Smith and solemnly assured him that the public were 'running a rig' upon him--making a scape-goat of him--and so forth. Mr. Smith referred to the receipts of his book, and replied: 'Not much, I guess.' " Ma-ka-tai-me-she-kia-kiak was the first book of verse to be published in Wisconsin. The fact that Smith willingly played along with the joke that others thought they were playing on him is evidenced by a letter he wrote to the Syracuse Star in November 1846, which ran alongside an article reporting the arrival of the celebrated “Wisconsin Bard” in Syracuse, New York. Illustrious brethren of the sacred order! When you hid laughter I concealed a smile! And of this farce will more in future tell.